Although average rents across all apartments have shown recent growth, data seems to suggest that the number of new and near-new apartments hitting the rental market are having a strong influence on average rent, while rents in older buildings are staying relatively flat. The newer apartment buildings are attracting higher rents. In Tokyo’s 23-ku, the average monthly rent of a 3-yr old apartment in the first quarter of 2014 was 4,081 Yen/sqm, up 3.8% from 2013 and up 12.7% from the recent bottom in 2012. Rents are 3.4% lower than the peak in 2008. In 30-yr old buildings, the average rent in 2014 was 2,603 Yen/sqm, up just 0.7% from last year and up 1.4% from 2012. Rents are down 14.7% from their peak in 2008. As you can see in the graph below, the average rent of new apartments has typically remained around 700 ~ 800 Yen/sqm higher than the average for all apartments, but in the past year it has increased at a higher rate. Since 2012, a growing number of new apartments have been purchased by investors and put up for rent as soon as the building was completed. This has pulled up the average for the 3-year old apartments. 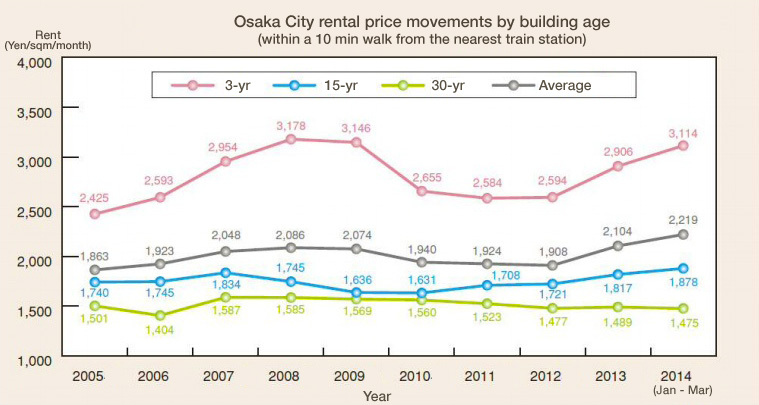 Osaka’s rental movements show similar trends to those in Tokyo. It is the 3-yr old buildings that have seen the highest growth in the past two years. While 15 and 30-yr old buildings have remained relatively stable over the past 10 years, the rental movements in 3-yr old buildings has been volatile in response to changes in the property market. The average monthly rent of a 3-yr old apartment in 2014 was 3,114 Yen/sqm, up 7.2% from 2013 and up 20% from 2012. The average is now just 2% below the peak in 2008. 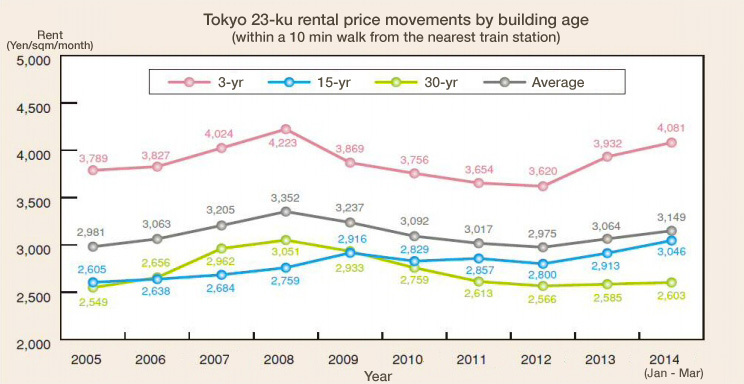 In 30-yr old buildings, the average rent dropped 0.9% from last year to 1,475 Yen/sqm. It is down 7.1% from its peak in 2007. 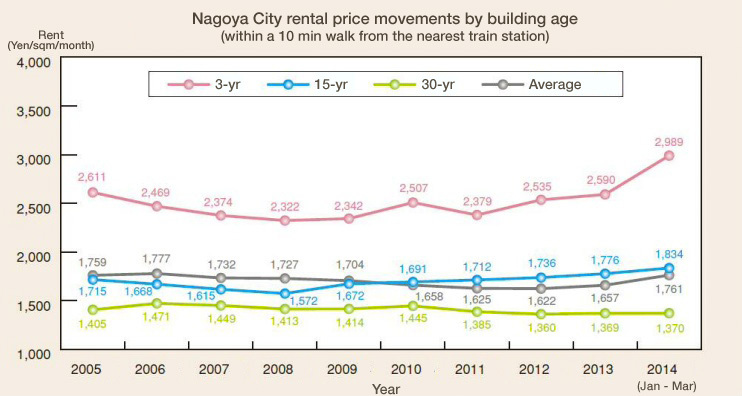 Nagoya didn’t experience any rental growth in the lead up to the mini-bubble in 2007-2008. In the past year, however, a number of investors have been purchasing new apartments with the intent of renting them out. 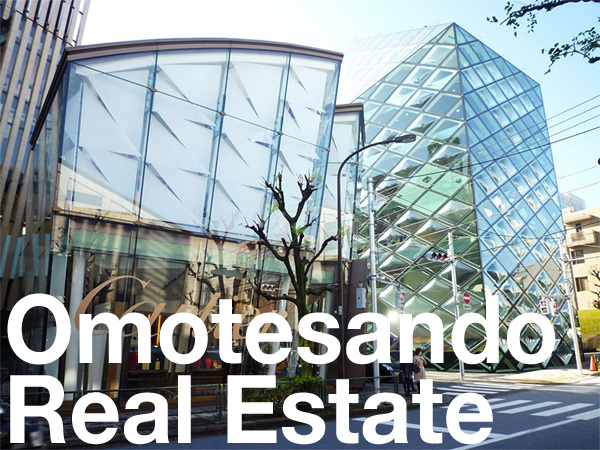 This has caused the 3-yr monthly rent to jump by 15.4% from last year to 2,989 Yen/sqm. The rent in 30-yr old apartments has been on a slow downwards trend for the past 10 years. 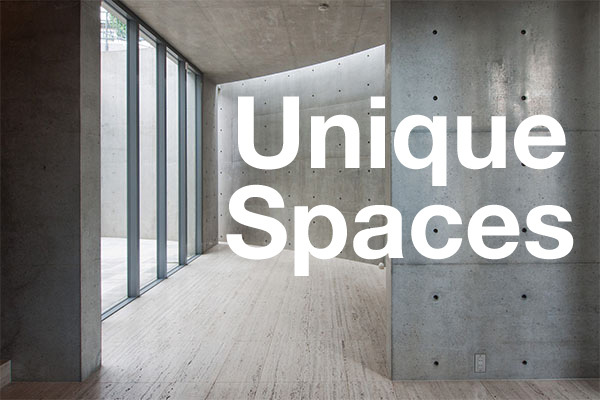 The data focused on 40 ~ 100 sqm condominium apartments in Tokyo’s 23 wards, Osaka City and Nagoya City. Data was collected between 2005 and March 2014. Source: Tokyo Kantei, May 7, 2014.